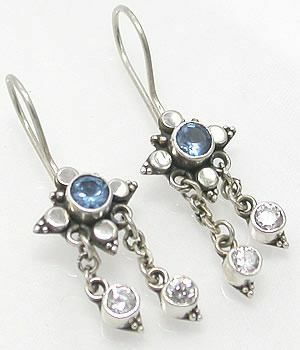 These Bali French Hook Earrings feature a stunning light blue jewel with triangular sterling silver petals. Off of the bottom of the gem are two sterling silver dangle chains with round crystal gems. These elegant earrings are sure to add pizzaz to your outfit. Check out for this matching Elegant Bali French Belly Button Ring for a more elegant look.